Australia started the match as they meant to go on aggressively bowling at the English batsman as though their lives depended on getting them out. England started as, I hoped, they didn’t mean to go on. Cook was dismissed LBW for 12 runs & Root, after taking a review, was dismissed LBW for 6 runs! England fans would have expected Pietersen to be the one to save the day but they looked on in disbelief as he nicked the ball & was caught for a mere 2 runs. This was a huge wicket for Australia who couldn’t hide their emotions as they ecstatically hugged each other in celebration. It is at this point I wondered if we have it in us to retain the Ashes, the fear of failure had risen again! Australia continued their aggressive play but despite this Bell started to ease into batting. Trott pushed his luck times as he was almost lured several times into nicking the ball & getting himself caught. Between them Bell & Trott got the game going again for England reaching their 50 partnership. Trott continued to push for England hitting two 4’s straight after lunch. Unfortunately, he pushed his luck too far & it failed him as he skied a ball towards Kawaja who caught it. Trott was out for 58. Despite another wicket falling Bell looked comfortable, taking the game in his stride. Suddenly luck decided to give England a chance. Bairstow was bowled by Siddle BUT was called back by the umpire after a no ball was given. Bairstow needed to make the most of this free pass. The game continued & Bairstow & Bell reach their 50 partnership. After tea Bell & Bairstow continued to pull it back for England. Luck came into play again as Agar bowled to Bell who caught the inside edge the ball bounced agonisingly close to the stumps but missed. Bell reached a well deserved 100 runs, but no sooner had he done so than he was caught by Clarke & was out for 109. Bairstow soon followed being caught & bowled by Smith for 67. The England fans anxiously watched on hoping this wasn’t the beginnings of a collapse. Bresnan & Prior needed to find a groove & stick to it but Prior was out for 6 after the slightest of touches & caught by Haddin. Anderson came out as nightwatchman & Australia took the new ball hoping it would cause some havoc before the end of play. But Anderson batted defensively to keep them safe until the next day. 1st ball of the 2nd day & Bresnan was caught for 7. This was not the start England wanted or needed! Broad did well to try & settle in & started to get the runs going. He should have been caught at one point but was lucky that the keeper didn’t (for some reason) go for it. Anderson wasn’t so lucky & was caught for 12. England had over 300 runs when Swann entered the game but they needed to get as many more as they could. Broad & Swann worked hard to do just that. Broad was caught, but he reviewed (might as well). It proved the original decision should stand he was out for 33. England all out for 361. Australia come in to bat. Anderson was certain that Watson was out 1st ball but the umpire disagrees & England choose not to review. A wise choice it turns out looking at hotspot. Watson & Rogers started to get some runs under their belts with Watson certainly getting into the swing of things. Watson was bowled LBW but he didn’t leave the field opting instead to use a review. It is a wasted effort he is out for 30. Roger swung massively for the ball but it was much slower than he expected missing it. The ball hit his midriff & England cry LBW. The umpire agreed. Rogers waivered as though he might review but he walks for 15. Unfortunately for Australia the replay showed the ball would have missed the stumps. Australia have showed a lack of cunning when it comes to their reviews with Watson wasting one & now Rogers not standing up for himself. Hughes used Australia’s last review & was out for 1. He is livid but hotspot does show contact. Another moment of excitement arose as England claim they’ve run out Clarke but after consulting the 3rd umpire & seeing the replay it is decided not out as Clarke is miles in. Kawaja was the next to fall as he stuck the ball sky high without length & was caught by Pieterson for 14. Bell donned a helmet & came in at silly mid-on to catch Smith for 2. Broad bowled to Clarke & cried LBW, the umpire agreed & with no reviews left Clarke had to leave the field for 25. Replays suggested if he was able to review he wouldn’t have been out as he hadn’t touched the ball. It has to be said that Australia were crumbling big time. Agar came in to bat, he hit the ball & went to run but Haddin didn’t budge leaving Agar to scramble back to his crease where he was run out by Anderson for 2. Siddle was caught in the slip for 2 & Haddin caught the ball top edge & was caught by Trott for 7. The Australian fans looked on in disbelief while the English fans were elated but possibly also in shock! Swann missed notching up a caught & bowled but it all came to an end when Pieterson caught Harris for 10. Australia were all out for 128! England were left with a choice, do they enforce the follow on or try & dominate the game by creating a larger target for Australia? England decided to bat, with Cook & Root to start. Haddin missed catching Root (something he would regret later!) as he & the 1st man in slip missed the ball & it rolled for 4. Siddle raised Australia’s spirits by bowling Cook for 8 & then bowling Trott for 0. Pieterson almost fell to the same fate as Trott as he caught the ball on his inside edge dragging the ball down, but instead of hitting his stumps the ball rolled through his legs. It was not long though until Pieterson was dismissed as he was caught by Rogers for 5. Australia were now full of it & had renewed hope that they could bring the game back. They ended the 2nd days play on a high. The 3rd day started with a question mark over England’s batsmen. Could they achieve the runs they needed to to secure victory or were they about to crumble? Bresnan took a little while to get going, but Root settled in quickly. Both seemed to be dealing well with all that the Australians threw at them & they reached their 50 partnership. It certainly seemed as though England were in no rush & were happy to take their time getting the runs they needed. Root reached a milestone of 1000 runs in his career & took a moment to celebrate this. A moment of excitement occurred later when Bresnan & Root were indecisive about running & Bresnan had to turn back after running 1/3 of the pitch & was nearly run out! A sigh of relief was almost audible from the English crowd as they saw the ball sail past the wicket. Bresnan was eventually caught at mid wicket as a bouncer dismissed him for 38. Play continued with Bell now out to bat. Smith created a moment of anxiety as he “thought” he’d caught Bell. Bell didn’t move from his crease, the 3rd umpire is consulted & decided he’s not out. England started to gain momentum & Siddle showed Australia’s growing frustration by bowling an aggressive bouncer at Bell hitting his fingers. Root celebrated his 2nd 100 for England as he & Bell continued to push through runs. The Australians were not posing any real threat & Root & Bell reached their 100 partnership. Bell smashed the ball straight to mid wicket. He regretted the shot instantly as he fell to his knees watching the ball land in Roger’s hands. He was out for 74. Roger’s did well to keep hold of the ball which was going at a pace, I should think his hands stung after he caught that one! Cook didn’t take this opportunity to declare & Bairstow came in to bat. Root & Bairstow started to wack the ball about with Root making two 6’s. At the end of the days play Root came in to a standing ovasion from both English & Australian fans alike. A brilliant days play from him at 178 not out. Day 4 started with Australia showing their determination & aggression had disappeared. They looked like they has given up. Luck did strike, however, as Bairstow was caught for 20. Agar bowled to Prior who smacked the ball straight back at him. It should have been all over for Prior as the ball bounced up to Agar’s hands but he couldn’t keep hold of it & Prior survived. Root hit an awkward shot up above & behind him & was caught for 180. Cook declared implying the reason he may not have declared sooner was to allow Root to try & reach 200. Australia needed 583 to win. Watson & Rogers started the Australian batting looking uneasy. Watson was dismissed LBW & walked for 20, this time deciding not to waste a review. It was a good decision on his part as the replay showed he was out. Rogers was bowled for 6 by Swann. He’d left the ball which turned late & smashed into the stumps. Hughes fell soon after another LBW. He reviewed but it was inconclusive & left to the umpire’s decision. He had to walk for 1. Bresnan showed some fire as he bounced a ball at Kawaja hitting his hand. But some frustration was shown when Prior missed a stumping & Clarke lived to bat again. Kawaja showed Australia still had some fight as he ran straight into Swann who reeled on the floor clutching his back. Was it intentional? Swann had every right to stand where he was & Kawaja could see him. Broad bowled a bouncer to Clarke who failed to get out of the way & the ball struck his head. Anderson came in to bowl, trying to get the ball to turn. Kawaja batted defensively against this, just trying to survive. Kawaja & Clarke both reached 50 each, as they started to relax & settle in they got the runs going. Root span the ball to Clarke, it turned making contact with the bat & he was caught by Cook for 51. Root repeated this ball to Kawaja who was caught by Anderson for 54. Smith caught the inside edge & was caught by Prior. He reviewed the decision but was proved out. He had to walk for 1. The next dismissal I have to admit was a surprise to me. Agar was caught but he refused to move saying he didn’t hit the ball & used a review. Hotspot didn’t show any contact on the bat although there was some to the ball (hit pad?). The 3rd umpire gave it out as he went on the noise he heard not the hotspot. Agar was furious at the decision repeating to the umpire that he did not hit the ball. In a way I have to agree with him, hotspot did not show him hitting the ball & although there was a noise it could have been pad, his foot or the ground. In my view there was no conclusive evidence that he was out. But he had to walk as the decision was final, he was out for 16. Haddin fell not long after as he left a ball which turned & hit his leg for LBW. Hawkeye showed that it wouldn’t have hit the stumps but the Australians had no reviews left & he left the field for 8. England used their last review on Siddle calling for an LBW. Luck was on Siddle’s side as the 3rd umpire went with umpire’s call. Luck stayed with Australia as England made a few drop catches. Frustration started to show in the England team. But Anderson came in to bowl & got Siddle for 18. One more wicket was required for England to win the game & the 8 extra overs were taken. England fans held their breath as Australia survived ball after ball. In the last over with 3 balls left to play Swann bowled to Pattinson, there were cries of LBW, he was out for 35. 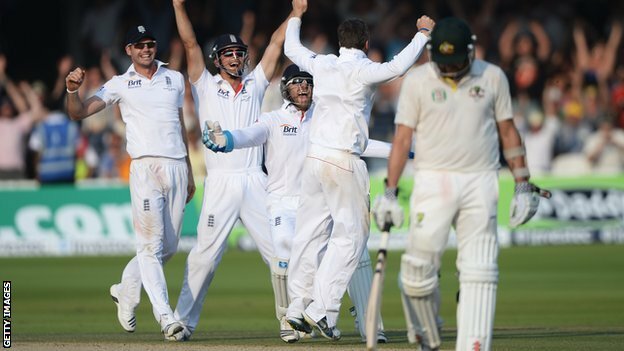 England burst into celebration as they won by 347 runs & are now 2-0 up in the Ashes series. Australia – Harris for his 7 wickets in the 2 innings. England – Root for his 180 runs. Swann for his 9 wickets in the 2 innings. This entry was posted in Extracurricular Sport and tagged 2013, Ashes, Australia, Bairstow, Batting, Bell, Bob Woolmer, Bob Woolmer Sales, Bowling, Bresnan, Clarke, Cook, Cricket, England, Game, Kawaja, Lords, Pietersen, Siddle, Trott.